Actress/model Kim Hyo Jin (김효진) who will be acting as Seo Joon in upcoming KBS drama, 'Mary Stayed Out All Night' attended the press conference on November 3, 2010. Kim Hyo Jin (김효진) wore an outfit from Balmain Fall 2010 collection. With the statement Silk-blend Tweed Military Jacket which retails for USD$6285.00 on Net-A-Porter. 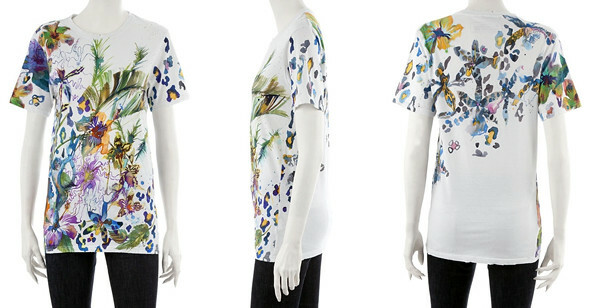 She also wore Balmain Painted Floral Print T-Shirt, USD$633.00 on Farfetch.com. Her outfit was completed with a pair of biker jeans from Balmain and (what's look like) Suecomma Bonnie embellished open-toe boots. She would have worn me over if she didn't choose a t-shirt with colored-prints all over. Incredibly distracting! The blazer should have its own 'moment'. I agree with you about the graphic print.... Doesn't really fit with the military theme going on.